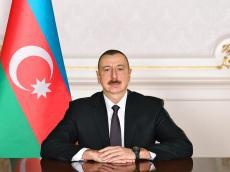 Tensions, risks and threats are rising in the world, but Azerbaijan is a place of stability, said Azerbaijan’s President Ilham Aliyev in his congratulation to the Azerbaijani people on the occasion of the Solidarity Day of World Azerbaijanis and New Year. "It is possible to say with certainty that 2018 was a successful year for our country. Our country has developed successfully in all directions. Azerbaijan has asserted itself as a strong country in the world. Our international positions have consolidated further. This year I have made 16 foreign trips. Sixteen heads of state and government have visited our country, which shows how widespread our bilateral relations are. At the same time, Azerbaijan has been successfully operating within international organizations. We have managed to secure a worthy place in the international arena," President Aliyev said. The head of state noted that our relations with neighboring countries have risen to an even higher level. "This is very important for each country, including Azerbaijan. The work we are doing in the political, economic and other spheres together with our neighbors strengthens stability in the region. As for stability, I can say that tensions, risks and threats are rising in the world, but Azerbaijan is a place of stability. In 2018, our people lived in peace and stability. The main reason and source of this stability is the unity between the people and the government," President Aliyev said. President of Azerbaijan noted that we have further strengthened our relations with the European Union. "The Partnership Priorities document signed between the European Union and Azerbaijan this year is a manifestation of the high level of these relations. This document clearly states thoughts on the territorial integrity, sovereignty and inviolability of our borders and shows again that the European Union adheres to the right position on the settlement of the Armenia-Azerbaijan Nagorno-Karabakh conflict. Our role in Islamic solidarity issues is growing. The Organization of Islamic Cooperation gives a high assessment to our policy in this area and we can say with full confidence that Azerbaijan has strengthened its strong role in the Muslim world. The attention, respect and sympathy we enjoy in the Muslim world shows that Azerbaijan has achieved great success in this area as well," President Aliyev said. The head of state recalled that this year, the issue of the legal status of the Caspian Sea was also resolved. "This is a historic achievement. As you know, this issue remained unresolved for years. However, it has now been resolved and Azerbaijan has made a valuable contribution to that," President Aliyev said.